The Marriott Long Wharf hotel is located in the heart of Boston’s historic waterfront. The hotel was completed in 1982, and was designed to resemble a ship with a simulated bow, stern, and deck. The interior emulates that of a luxury cruise ship. To blend with nearby architecture, higher stories were set back, as to not overwhelm the older and shorter buildings on the wharf. This unique design allowed for open views of the waterfront and harbor from nearby buildings. The hotel is seven stories tall and offers 397 guestrooms and 15 suites. Views from the guestrooms are splendid, with Central Wharf and the Seaport District visible to the south, and Christopher Columbus Park and the North End to the north. The rooms are nicely furnished in cherry wood, with pillow top mattresses and 300 thread-count linen. There are complimentary coffee makers, refrigerators, and safes in each room. The bathrooms are accented in marble, with rainfall showerheads, curved shower rods, and granite vanities. There are 17 flexible meeting rooms for business needs, and a Grand Ballroom available for weddings or events of significant size. Concierge, secretarial, and business services can be provided by the hotel. The Financial District may quickly be accessed via State Street or Atlantic Avenue. Logan Airport is conveniently located only minutes away just across Boston Harbor. An indoor pool, a rarity in downtown Boston, is also available for guests. Long Wharf itself is very historic and dates to 1710. The pier was given its name due to its length, originally jutting out more than 1800 feet into the harbor. The pier had extended inland all the way to the old Custom House, and as the waterfront was filled-in, its length was greatly reduced. The following is a description from 1719 by Daniel Neal: "At the bottom of the bay is a noble pier, 1,800 or 2,000 feet long, with a row of warehouses on the north side for the use of merchants. The pier runs so far into the Bay that ships of the greatest burthen may unload without the help of boats or lighters. From the head of the pier you go up the chief street of the town, at the upper end of which is the Town House or Exchange [Old State House], a fine piece of building containing beside the walk for the merchants, the council chamber, the house of Commons, and another spacious room for the sessions of the Court of Justice." Numerous attractions surround the Marriott Long Wharf. 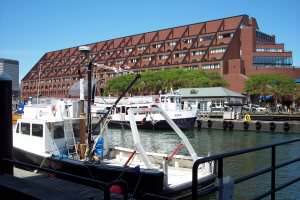 New England Aquarium is located on Central Wharf, which adjoins Long Wharf. Faneuil Hall Marketplace, famous for its dining and shopping, is located just across Atlantic Avenue. The Freedom Trail can be found at Faneuil Hall at the other end of the Marketplace, and traverses south to the downtown area or to the ancient North End in the other direction. The Old State House, Boston Massacre Site, Mayor Curley Park, Holocaust Memorial, Capen House, Hancock House, and Boston Stone are all located near Faneuil Hall. Fine examples of Boston architecture close to Long Wharf include the old Custom House and the Grain Exchange building. Long Wharf also bustles with harbor activity. Whale watches, tourist speed-boats, and harbor cruises are launched from just outside the hotel. A pleasant cruise via water taxi to the U.S.S. Constitution in Charlestown is conveniently available from a nearby pier. Long Wharf is part of the Boston Harborwalk, which allows a continuous path from the hotel to the Seaport District along the waterfront.